The Lilac Fire that burned 4,100 acres in the North County between Fallbrook and Oceanside remained 95 percent contained Wednesday, and several hundred firefighters were released from their assignments digging containment lines around the burn area. Cal Fire officials said responsibility for the fire will transition Wednesday from an incident management team — made up of Cal Fire, the North County Fire District and the Vista and Oceanside fire departments — to the local Cal Fire San Diego unit. As that transition was set to get underway, officials were thinning the ranks of fire crews assigned to the incident. On Tuesday morning, there were still 1,399 firefighters and other personnel helping contain the Lilac Fire. That number was down to 944 on Tuesday evening and 779 as of 7 a.m. Wednesday. In total, 1,659 firefighters and other personnel helped battle the inferno since it broke out last Thursday morning. Most of the firefighters still assigned to the incident were hand crews digging a perimeter of containment around the smoldering burn zone near Camp Pendleton. Officials expect to have the swaths of blackened terrain fully contained by Dec. 21, which would mark two weeks since the flames erupted for unknown reasons just west of Interstate 15 and north of Lilac Road in Pala Mesa amid gusty, arid Santa Ana winds. The Lilac Fire destroyed 157 structures and damaged 64 more, but no human deaths were reported. At least 46 horses died, many of them stabled at the San Luis Rey Downs Training Center in Bonsall. A large animal shelter at the Del Mar Fairgrounds was the only shelter that remained open Wednesday after the last Red Cross shelter at Palomar College closed Tuesday. 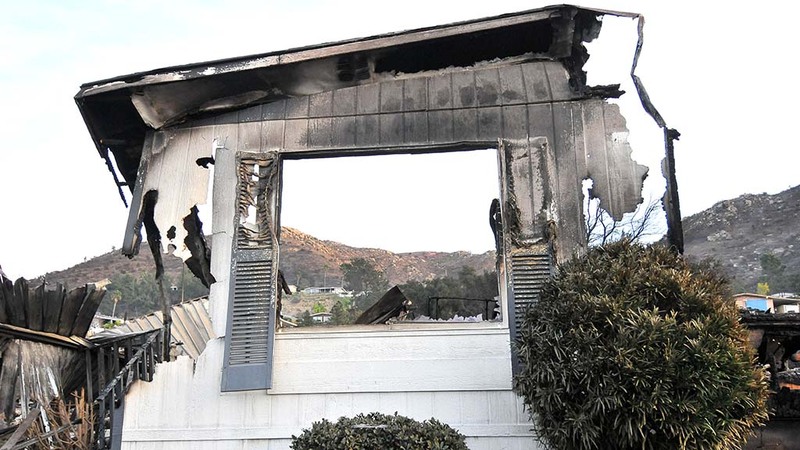 All evacuations have been lifted, though access was still restricted Wednesday to residents of the hard-hit Rancho Monserate Country Club mobile home park in Fallbrook. Cal Fire Battalion Chief Henry Herrera said that many of his agency’s firefighters, on being released from the Lilac Fire, will be assigned to the Thomas Fire in Ventura and Santa Barbara counties. At more than 237,000 acres, the Thomas Fire is the fifth largest wildfire in California’s history. The 2003 Cedar Fire in San Diego County still holds the record as the state’s largest wildfire at 273,246 acres burned. The 2007 Witch Fire and 1970 Laguna Fire, both in San Diego County, are also among the 10 largest in California history.